Two-generation approaches focus on creating opportunities for and addressing needs of both children and the adults in their lives together. The approach recognizes that families come in all different shapes and sizes and that families define themselves. If you would like to use any of Ascend’s 2Gen graphics, you can download a quick and easy Zip file here. We kindly request that you attribute these graphics to Ascend. Two-generation approaches can be found along a continuum. This graphic illustrates the starting point (parent or child) and the relative emphasis. Whole-family approaches focus equally and intentionally on services and opportunities for the child and the adults in their lives. They articulate and track outcomes for both children and adults simultaneously. Child-parent approaches focus first or primarily on the child but are moving toward a two-generation approach and include services and opportunities for the parent. Parent-child approaches focus first or primarily on the parent but are moving toward a two-generation approach and include services and opportunities for children. 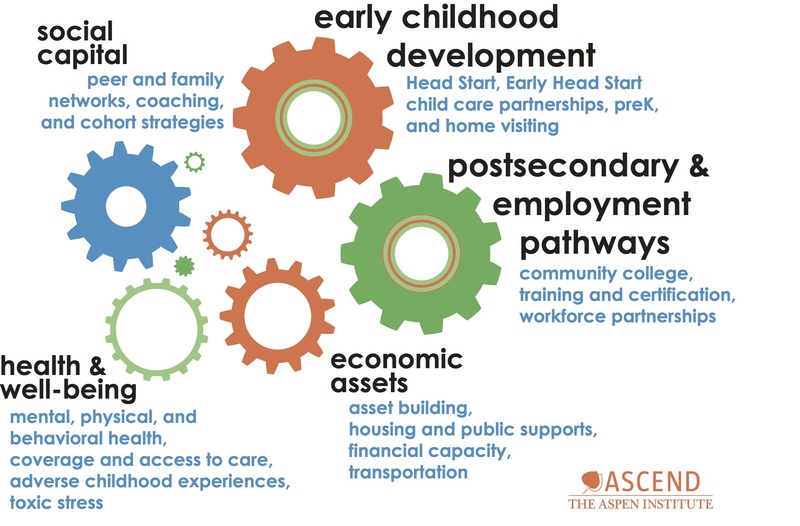 In addition to the continuum, there are 5 Key Components of the Two-Generation Approach: 1) Postsecondary Education and Employment Pathways; 2) Early Childhood Education and Development; 3) Economic Assets; 4) Health and Well-Being; and 5) Social Capital. Investments in high-quality early education yield a 7-10 percent per year return on investment based on increased school and career achievement as well as reduced social costs. At the same time, parents who complete a college degree double their incomes. A parent’s level of educational attainment is also a strong predictor of a child’s success. 2Gen education programs and policies include postsecondary education and employment pathways; early childhood development programs, like child care, Head Start, and home visiting; family literacy; and K-12 education. A $3,000 difference in parents’ income when their child is young is associated with a 17 percent increase in the child’s future earnings. A relatively small increase in household income can have a significant, lasting positive impact on the life of a child. Nevertheless, almost half of all children in the United States belong to families with low incomes. Almost three-fourths of single-mother families with children are low-income. Poverty alleviation is dependent on families’ abilities to successfully manage financial setbacks and build economic security. Children with as little as $499 in an account designated for college are more likely to enroll and graduate. Even small dollar amounts help children see a college education as a possibility. Economic assets include housing, transportation, financial education and asset building, tax credits, student financial aid, nutrition assistance, and more. The Bottom Line: Impact Investing for Economic Mobility in the U.S.
Childhood trauma, for instance, has lasting health and social consequences. Similarly, economic supports, such as housing, and social capital, such as connections to one’s neighborhood and community, are important social determinants of health. The dynamics of federal and state health care access policies through Medicaid are critical factors in identifying barriers and opportunities for increasing the health and well-being of children and their parents. Social capital is a key success factor of the two-generation approach. Many years of research has shown that social capital manifests as peer support; contact with family, friends, and neighbors; participation in community and faith-based organizations; school and workplace contacts; leadership and empowerment programs; use of case managers or career coaches; social networks, such as cohort models and learning communities; and mental health services. Social capital builds on the strength and resilience of families, bolstering the aspirations parents have for their children and for themselves. It is a powerful component in programs that help move families beyond poverty.